Bruno Frisoni presented this pair of lovely heels for the House of Roger Vivier in Paris earlier. Roger Vivier is credited with the invention of stilettos. 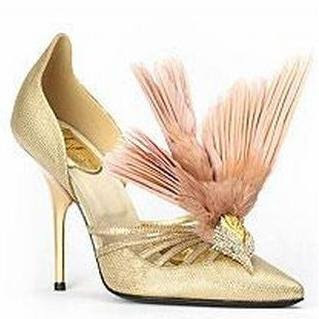 This pair of heels is made of 24K gold net, with precious and semi-precious stones in the shape of a bird. How realistic is that bird sitting atop of the toe box, talk about art and fashion. However, I will be too scared to wear this as the retail price will set a gal back 30,000 pounds or about $42,800 according to the exchange rate today. In this slumping economy, a gal may have to defend her shoes in a dark alley from potential robbers. Also in this slumping stock and housing market, it's almost a crime to spend $43,000 on a pair of heels. I just adore this shoes! WOWZA - those are INSANE!! i think the hubs would laugh at me if i wore these.